You can never have enough adventure when you're a GURPS Dungeon Fantasy hero. Fortunately, we're here to imperil you again . 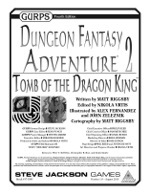 . . with GURPS Dungeon Fantasy Adventure 2: Tomb of the Dragon King! Visit the Tomb of the Dragon King for an adventure your heroes might remember for the rest of their lives (which may be shorter than they think). Excitement is just a download today from Warehouse 23!